Two years after the Dieselgate scandal first broke the full scale of the cheating and deception by carmakers is still emerging. There are now 37 million dirty diesel cars and vans on the EU’s roads. But whilst the way carmakers have cheated emissions rules is becoming clearer the response from carmakers and Governments is derisory with only a tiny fraction of these diesels cleaned up. This report draws on a wide range of data and analysis to examine the underlying reasons for Europe’s diesel addiction, i.e. the biased regulations and taxes that have artificially created the bloated sales of diesel cars in Europe that until recently represented over half of the new car market. It also examines the consequences for health and the environment and wider economic effects of dieselisation. Contrary to perceived wisdom it shows that diesel cars are not actually lower carbon than gasoline versions if emissions are considered across the full lifecycle of the vehicle. One of the key reasons for Europe’s higher share of diesel cars has been the laxer air pollution emission limits that have allowed diesels to spew more toxic NOx emissions than petrol-fuelled vehicles. The lax tests allowed cheap after treatment systems to be installed that are at the heart of the dieselgate scandal and save the car industry over Euro 500 per vehicle that would otherwise make diesel cars prohibitively expensive. The introduction of the new real-world emissions (RDE) tests are a step forward but perpetuate the bias by allowing future diesel engines to emit 2-3 times more NOx than gasoline. Similarly, the EU car CO2 regulations were designed to favour heavier vehicles by raising carmakers targets by 3.3 g CO2/km for every additional 100kg, thus favouring diesel vehicles. Whilst EU regulations create an uneven playing field for diesel, fuel and vehicle taxes set at a member state level incentive their purchase. Diesel fuel is taxed significantly less than petrol in most countries, making it 10% to 40% cheaper at the pump. This ‘diesel bonus’ has also resulted in a drop in real income from fuel taxes and cost national budgets almost EUR 32 billion in lost tax revenue last year alone. Together these regulatory and financial distortions have skewed the vehicle market in favour of diesels and raised its sales share to above 50%. This is in stark contrast to other global markets where in the absence of biased regulation diesel’s share is consistently below 5%; in the USA and China it is 1% and 2% respectively. 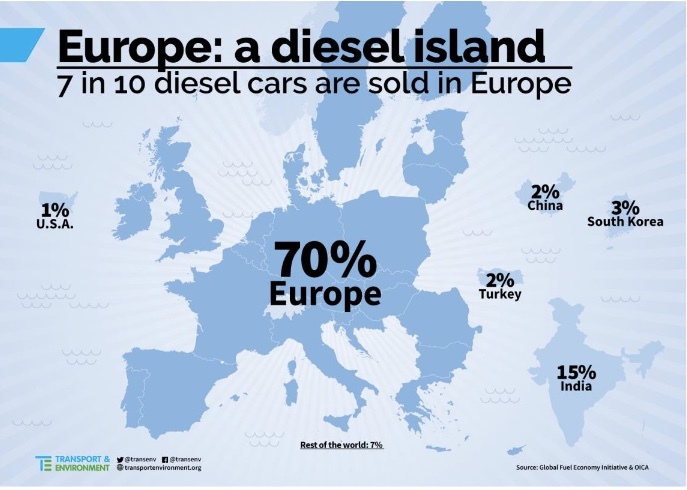 Europe is now a diesel car island, accounting for 70% of world’s sales of diesel cars and vans. This share is set to grow in the future as light-duty diesel becomes the technology of the past that no one else in the world want to use or develop. ● High GHG emissions of biodiesel substitutes when ILUC emissions are factored in. This analysis does NOT take into account all of the additional Kms diesels are driven. New direct injection gasoline engines are now significantly more efficient closing the gap with diesel. The the average CO2 emissions of new diesel cars (119g/km) are only a few grams/km lower than an average (often less powerful) petrol car (123g/km). If the Euro 2,000 cost premium of diesel over petrol car is taken into account gasoline cars already outsrip their diesel counterparts. For example hybrid systems are now no more expensive than diesels (and cheaper in some markets) but average 89g/km. In the medium term the opportunities to lower CO2 emissions from cars are primarily from gasoline and electric solutions. To 2050 electric is the most cost effective technology. 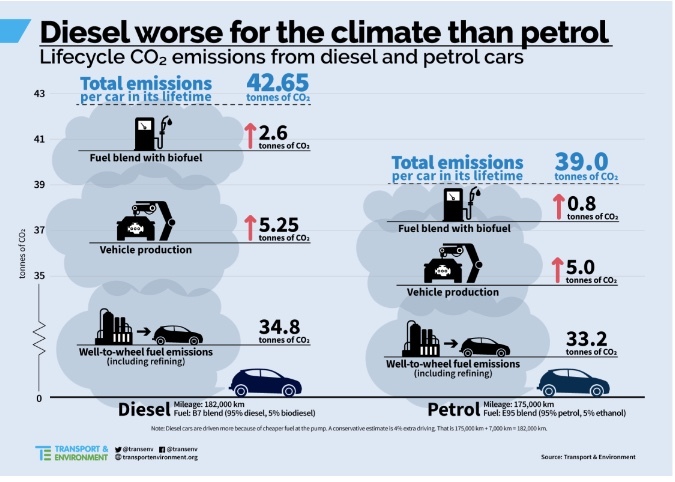 Since diesel is not better for the climate than petrol there is no justification for its preferential treatment. Since Dieselgate erupted in September 2015 diesel vehicles have been shown to be the dominant reason for the high levels of toxic nitrogen dioxide pollution across European cities and the resulting death toll of 68,000 Europeans from breathing air with high levels of nitrogen dioxide. The hundreds of real-world emission tests carried out in the aftermath show that around 80% of all cars and vans sold in Europe since 2010 (37 million) are grossly polluting, exceeding the NOx emission limits by over 300%. Almost every European carmaker – including Daimler, Renault and Fiat – has now been engulfed by the scandal amidst allegations of rigging emissions tests. The new Real Driving Emissions (RDE) regulations, based on on-road PEMS testing, have entered into force in September 2017 and are expected to bring down NOx emissions from new vehicles after 2019. However, recent tests carried out by ICCT point to some new diesel cars specifically designed and calibrated to pass the new stricter tests while NOx emissions outside of RDE test conditions in the order of 26-40 times over the limits undermining any air quality benefits, in particular in urban areas. There is a vicious circle now revolving around diesel cars. New emissions tests and regulations are finally requiring better after-treatment systems raising manufacturing costs. Diesel cars are in the cross-wires of concern about our toxic air and legal pressure to enforce air pollution limits with diesel bans now proposed in many cities. Increasingly attractive competing technologies are eroding its market share in Europe, notably more efficient gasoline cars and in the future electric. Beyond Europe the hoped for growth of diesel in emerging markets has stalled so diesel remains a niche global powertrain for cars. With so many demands on research and development funds, further diesel development is becoming a low priority. 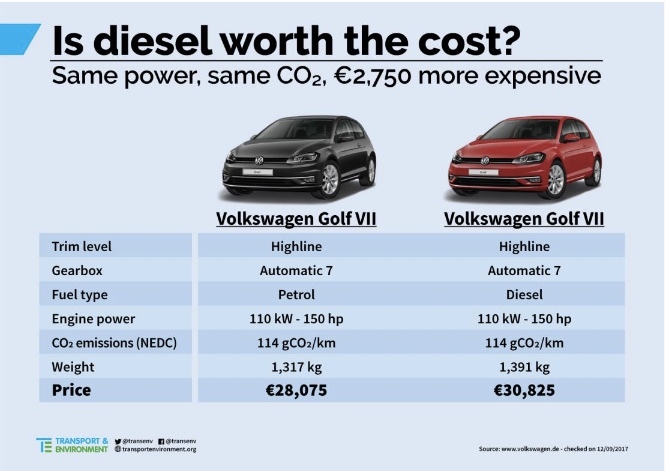 All of these factors were inevitably going to dismantle the dominance of diesel in Europe. However, the Dieselgate scandal has trashed its reputation as a clean solution but probably accelerated rather than initiated its decline. 3. Remove the diesel bonus and other biases in national tax regimes, and introduce fair fuel and vehicle taxes based on real-world CO2 emissions with an air quality increment. 5. Cities must put in place effective vehicle circulation restrictions when air pollution is above the recommended limits and ensure future low emission zones are designed based on vehicles real-world performance. The true story behind diesel is that it has enabled the industry to sell larger, more powerful and more profitable cars – but at a cost for Europe’s economy, energy security, climate and environment. It is time Europe stopped pouring money and energy into a globally niche 20th Century technology. The future is electric with Europe either joining the flow or drowning in diesel’s dirt.